I recently concluded that I learn more from Success than Failure… and yet, isn’t it ironic that we are still obsessed with learning from failure? It is popular belief – especially in the startup eco-system – that failure is a stepping-stone to success. I cannot deny that this gave me a lot of confidence (and comfort) when I co-founded a technology startup, as I believed that the worst outcome (for me) would be all the great learning that I will acquire, even if we faltered on the way. It was just one of those days when I was flustered – I was looking for answers and I was getting irritated as I realised that for every previous effort that had failed, I only knew what did not work. But I still had no clue of what would work? I asked myself – how effective is that learning – if I still have to go back to the drawing board and continue the search for answers on how to make it work? I was not very upbeat as I had gone through the process once and failed to find the answer, and what was the guarantee that the second search would be any more fruitful? 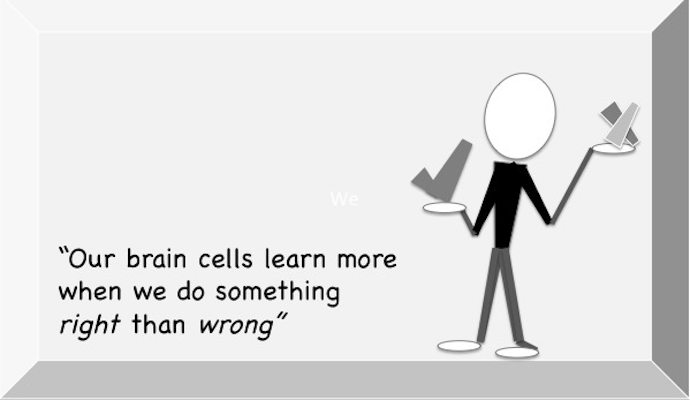 In that state of exasperation, I happened to come across an interesting neuroscience research that suggested that brain cells only learn from experience when we do something right and not when we fail. I was intrigued. I wondered if I could correlate it with my own personal experience – so I tried to test the theory on the problem at hand. Our mobile-video based service for sharing experiences, stories and insights is deployed across 25+ countries in Europe. Most groups are very actively engaged, but few still require constant nudges. All our discussion around driving adoption in the low-activity groups has always focused on what wasn’t working for these groups. That day we changed our outlook – we instead discussed everything that was working for the high-activity groups. We uncovered simple observations and found interesting patterns. We realised that we just had never bothered to re-apply this successful learning back into the groups that required external stimuli. That was the day I realised, that my obsession with learning from failure meant that I was simply – taking for granted – everything that was working for us. Here was an opportunity for us to focus on the success and build upon it – I knew what worked and I could make it happen again, maybe even do it much better. And yet I was spending more of my time in learning from failures. Why? It made no sense. I am now a convert. I now track our successes as much as (if not more) than the failed attempts. Of-course I know that I need to be cautious and ensure that I am not blinded by success. More importantly I am cognisant that I need to continuously strive to do better than the last success. And, of-course it also does not mean that I overlook failures – but I now look at them in the right context. Learn from success is my new mantra! I realise that the need is not to glorify success – but to recognize core strengths and convert them into strategic assets. Just as it is important to manage our weaknesses, we also need to diligently work on developing our strengths. And believe me – it is harder to focus on strengths, far much easier to lapse into failures, regrets, emotions. Arti is the co-founder of humanLearning – a fast growing UK-based technology startup – setup with an earnest desire to make the life of busy professionals simpler and more effective. humanLearning is disrupting business work-flows thru WinSight – a mobile-video based platform that empowers ‘every’ professional to benefit from each other’s experiences & insights in the easiest, fastest and most impactful way.